The cabinet looked easy to assemble in the store, but Sadie stared at the instructions as though they were written in hieroglyphics. They might as well have been, for all of their nonsensical symbols and pictograms. She looked back down at the two panels she was trying to fix together and sighed. Still, the furniture wouldn't put itself together, and they needed somewhere to house the TV. At least that way they'd have something to do on an evening, instead of staring at boxes, hoping they'd unpack themselves. She leaned forward and began tightening the left screw. The wood moaned a complaint as the metal forced a spiral path within the pre-drilled hole. Sadie thrust her weight behind the screwdriver and twisted the handle. A crash sounded behind her, and Sadie jolted forward. The screwdriver jumped out of the screw head and cut into the palm of her hand. Blood welled up along the thin line, and stinging pain enveloped her hold hand. Sadie swore under her breath, and turned around to see what made the crash. The room was empty aside from herself and the furniture. Something warm trickled down her palm, and Sadie looked back to her hand to see blood dripping from the wound onto the floor. Sadie clambered to her feet and hurried into the kitchen. Two clean tea towels lay on the draining board. She wrapped one of them tightly around her hand to stop the bleeding, and carried the other back into the living room. She looked down at the floor in front of the half assembled cabinet and stopped. "Sweetie? Did you clean the floor?" Sadie called into the dining room. Toby poked his head around the door, paint splattering his hair and T-shirt. "I cut my hand on a screwdriver and it bled onto the floor, only now it's gone." "Are you ok?" Toby crossed the room and unwrapped her hand to inspect the injury. Blood oozed out of the cut and onto the towel. "I'll be fine, but the floor..."
Toby looked at the floor, and back at Sadie. "It must have soaked in already," he said, giving her a wink as he suppressed a smile. "Maybe it wasn't that bad," said Sadie. She looked around the room, still unsure what made the crash in the first place. "Come on, let's get that hand cleaned up." Toby led her out of the room in search of their first aid box. Somewhere in the dark depths, below the basement, the house licked its lips. That must be my house! 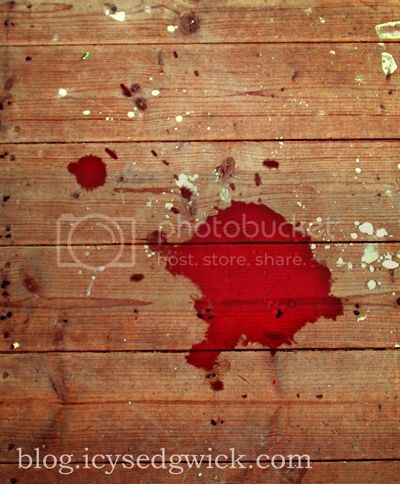 When we pulled up the carpet in the daughter's room to put in bamboo flooring, we found some blood spots on the sub-flooring. The house was causing pain even before it was finished. Love it! Wonderful last line! I agree with Helen, if needs a part two! You know, if the house licked up everything I spill and not just blood that might not be so bad. Still creepy as hell though. Nice work. Oh yes, perfect last line Icy! I too would like a part 2. Wonderful in a Lovecraft kind of way. I'm not sure if this really needs a part two but I'm glad everyone liked it. Great bit, Icy. I was sure it was going to be the bookcase itself that was out for blood.